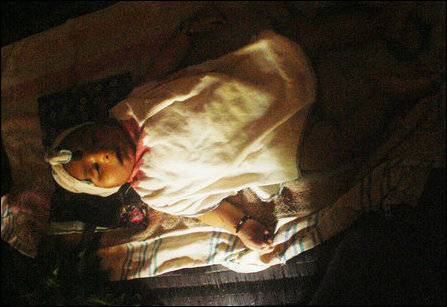 A 5-month-old child, sleeping inside an IDP hut near Thakarap-Pi'l'laiyaar temple on Hudson Road in Vaddakkachchi, was decapitated by a shrapnel of the Sri Lanka Army (SLA) fired artillery shell Saturday morning around 9:30. 26-year-old mother of the child was wounded in the artillery barrage that targeted the IDP settlement. Meanwhile, two males who went to their agricultural lands in Kanakapuram, a suburb of Ki'linochchi town, to unearth cassava roots, were killed in SLA shelling around 11:45 a.m. A 17-year-old youth narrowly escaped death with injuries from the shelling. 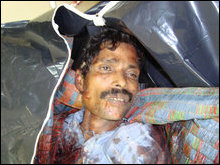 The child killed was Jeyarooban Ajanthan. His mother wounded in the shelling was identified as 26-year-old Jancy Rani Jeyarooban. 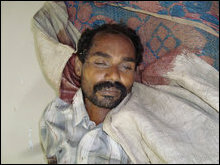 The victims had displaced from Periyapa'ndivirichchaan to Vaddakkachchi. The males killed in Kanakapuram were identified as 41-year-old Paalaiya Pulendran, a native of Ki'linochchi who was displaced to Visuvamadu and 34-year-old Krishnan Sutha, who had displaced from Pallavaraayankaddu to Visuvamadu. The victims had gone to unearth cassava roots in the agricultural lands in Kanakapuram in their attempt to earn money to safeguard their families. The youth who sustained injuries at Kanakapuram was identified as Jeyakaran, from Periyaku'lam in Pu'lyampokka'nai. He was being treated at Ki'linochchi hospital. The dead bodies of the two males killed in Kanakapuram were brought to the hospital in Ki'linochchi town and transferred to Tharmapuram. Meanwhile, Sri Lanka Air Force (SLAF) fighter jets bombed 6 times in Vaddakkachchi and Paranthan areas.